Lok Sabha Elections 2019: Indian General Election 2019 schedule has been released and the national election will be held in seven phases – on April 11, April 18, April 23, April 29, May 6, May 12 and May 19. 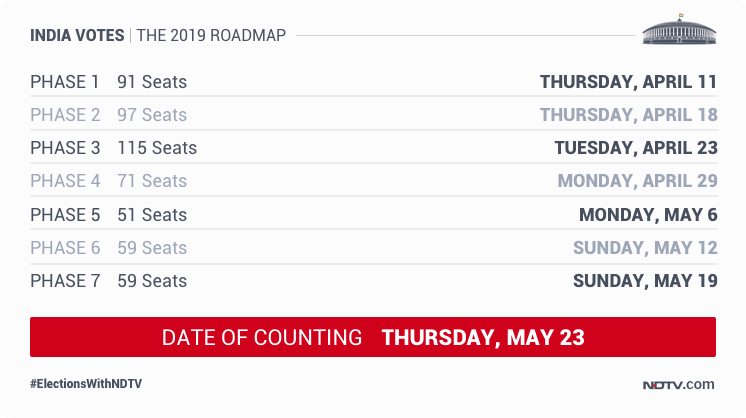 Indian General Election 2019 schedule has been released and the national election will be held in seven phases – on April 11, April 18, April 23, April 29, May 6, May 12 and May 19. This election will choose the 17th Lok Sabha. The members of the largest party or coalition will then choose the Prime Minister. Assembly polls will also be held simultaneously in Andhra Pradesh, Sikkim, Arunachal Pradesh and Odisha. Andhra Pradesh assembly elections will be held on April 11, Sikkim Assembly elections and Arunachal Pradesh assembly elections will also take place on April 11. Odisha assembly elections will take place in four phases on April 11, April 11, 18, 23 and 29. This year, more than 10 lakh polling stations would be set up to conduct the Lok Sabha election 2019, which is a new world record. This general election will see nearly 2,000 parties and over 8,000 candidates contesting for 543 seats In 2014 Lok Sabha election, Narendra Modi-led BJP had won 282 seats out of 543 constituencies in Lok Sabha, handing out a crushing defeat to the 10-year-rule of Congress-led United Progressive Alliance. Around 90 crore people are eligible to vote this time, the Election Commission has said. The number is an increase of about 9 crore compared to last time. It is estimated that about 13 crore voters this time will be first-time voters. The actual number of people who do vote, however, is far less. Even though 2014 saw the highest turnout ever in independent India’s history at 66.4 per cent, it meant a huge 27.3 crore people did not vote. Two-thirds of Indians are under 35. The model code of conduct is already in place. It is a set of guidelines that candidates, and political parties and governments must follow to keep elections fair.